Having teenagers care for children is a mainstay of our society. Whether it’s hiring the high school kid down the street for a date night with your partner, or having an older sibling look after a younger one for a few hours a day during the work week, it’s a pretty common practice. Since the time has now come for me to go back to work full-time, I decided that I want my choice to affect my children as little as possible. I haven’t been to work outside of the home in sixteen years. I have opted to work the night shift so that once my kids are in school, they will never even notice me gone. However, while all four children are on Summer Break, the older kids will need to babysit the little ones while I sleep for a few hours in the daytime. 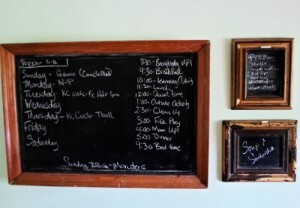 Although my teenagers have babysat in the past, I have put a bit of planning together to make things run more smoothly for all of them since sitting will be a regular thing. Keeping kids busy is the best way to avoid crisis. Bored kids are not only crabby, but will be much more likely to find things to do that will get them into trouble. Having a list of activities prepared that can be easily monitored and cleaned up can help the teenagers a lot. Many times when the kids begin to get unruly, switching tasks or starting a new activity can make a big difference. Teenagers can become frazzled and grasp for ideas, so having a list of activities written down can take a lot of the pressure off. I sat down with my kids and we came up with a list of 50 activities they can all do together. A strict routine allows for predictability. Being relatively unstructured works for me, but I feel that the teens will fair better with a schedule. Not only will this help the younger kids to know what to expect, the older kids will likely forget things if they are not programmed into the routine – like serving lunch. The schedule can also help when the younger children are feeling less than cooperative. Saying that it’s time to do a task, rather than simplytelling them to do it, can make the little kids feel less like they’re being bossed around. Since I will be home and available within seconds in case of a medical emergency, I have not enrolled my sons in CPR training. They have learned a lot already about basic first aid through their health classes at school. I have, however, given them a refresher for basic first aid and they know to wake me if they have a serious problem. If I were going to be away from the house, I would insist that they have proper training before they be allowed to provide care. We have also discussed what they should do in the event of a fire or a natural disaster. Waking up Mom is pretty much the answer to all emergencies. Observe: What precise actions are upsetting and state without judging, name-calling or putting down. Determine Feelings: Name which emotions are present, without blaming others for those feelings. Determine Needs: Name which exact needs are not being met. Requests: Name which specific actions will fulfill the unmet needs in a positive way. Don’t ask for a don’t. Teenagers will be much calmer and confident in caring for children when they don’t have to try so hard to figure things out. Do as much of the thinking beforehand as you can. Here is a list of things that I came up with, that can make a big difference for young care givers. Have menus planned so they won’t need to decide what to make. If possible, have the meals prepared in advance. Emergency numbers should be put where they can be accessed easily. Make sure the teenager has access to a phone (don’t rely on their coming equipped with a cell phone). Remove unnecessary hazards from the environment. Have activities already set up. Have spare outfits set out in case the child or children need to be changed, so that the teenager won’t have to go looking for them. Have towels handy in case of spills. Inform the teenager up front of any medical or allergy issues. In the case of infants, be sure to have plenty of diaper changing supplies and baby gear in a specific place so that they needn’t go hunting for them. Finally, make sure your teenager knows you are grateful. If you’re paying a sitter for an evening out, pay them well and let them know how much their caring for your child means to you. If your older child is caring for their siblings, be sure they know that you are appreciative. Resentful teenagers are not good care providers! Teenagers also need to know how important their role is to your child. My sons were informed upon meeting each of their tiny siblings that they would be incredibly important people in their lives.They get to be the heroes, teachers and best friends. That is something that they both take very seriously, and I trust them above most adults to look after my young children.